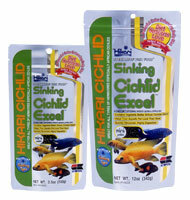 A Daily Diet For Herbivorous Cichlids And Larger Tropical Fish. A perfect balance of natural ingredients meant to meet the nutritional demands of most herbivorous fish offering a taste even the most finicky eater will love. Contains pure-cultured Spirulina offering vibrant, natural color enhancing capacity. Contains stabilized vitamin C which won’t degrade over time as easily as non-stabilized vitamin C and supports a healthy immune system.